Finally, the last of the summer's gelcoat repairs! 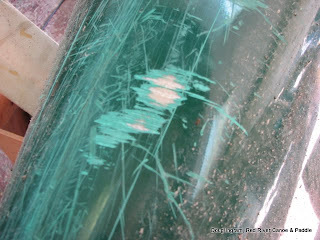 This one is a Bluewater "Chippewa" model canoe that had gotten a lot of abrasion form wave action and rocks. I think that granite stones might be considered to be 1 grit! Anyway, there were about 5 of these spots that were worn down to the glass layers. Some green gelcoat, let cure, lots of sanding (down to 2000 grit) and some marine wax polish and the repairs look better than the rest of the canoe. While we are at it, the owner asked that I tend to the gunnels. 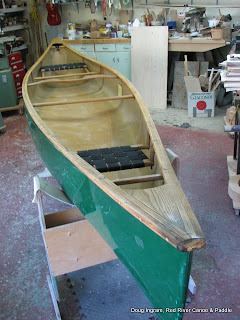 Most canoes with wood trim have only an oil finish applied. This is a legitimate finish, and it is fast and easy to apply in the factory by non specialist workers, but it DOES need to be maintained regularly. New oil finish needs to be applied as it is not a long term durable finish. 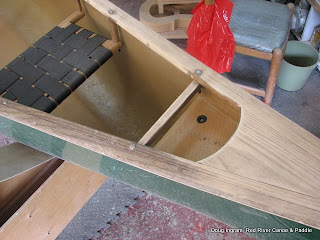 For this canoe, I had to give the wood a pretty significant sanding to clean out the accumulated grime, then I applied one sealer coat of varnish and two coats of oil. 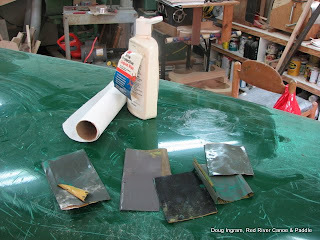 The one coat of varnish helps to keep the grime from getting deep into the wood grain. Here you can see the sanded and un-sanded portions.